This entry was posted in conspiracy, fake news, George Soros, Honduras-Guatemala 'caravan' invasion, illegal immigration, Judaism/Jews, Liberals/Democrats/Left, MSM, United States and tagged Fox News defends George Soros, George Soros on Nazi collaboration, Open Society Foundation, Pueblo Sin Fronteras. Bookmark the permalink. Next best thing to the Devil. You watch. They’ll spin this as a bunch of “deplorables” out to get the Great Giver. Somebody should scoop this POS up and drop him in Russia. They have arrest warrants out for him there. Because the first thing I’d do with an explosive device is carry it out of the house. Not. I’d carry myself out. Probably fake and planted by a Sorosbot. Who in their right mind would ever believe Soros gets his own Mail. Of course he has someone checking for all dangers. Funny in the timing though. He has been trying to destroy this country for years and suddenly he gets a little threat right before election. Not buying this one. 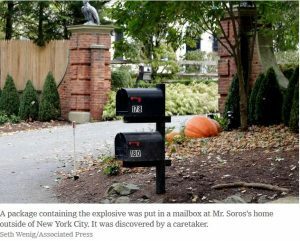 We’re supposed to believe that George Soros gets his own mail out of his mailbox? We’re supposed to believe the butler took the bomb from the mailbox to the woods? Even the FBI or Maxine Waters wouldn’t be this stupid, would they? Shill house for a shill guy. Soros is a top enemy of all living who is worthy of death and when he is dead the world will be a better place. The first of many false flags. It’s the only play the ORANGE MAN BAD crowd have left. They make him sound like a saint. He is far from a saint. He is a War Criminal. Why has he not been arrested? He stole valuables from the Jew’s before they were led to the gas chambers. He is a Jew himself. Evil man. Yet he hasn’t been charged. Unreal. Hope he gets his just deserts. Sounds odd that his employee took the bomb in the woods. A realistic person would of ran out of the house. Stinks to high heaven. They want them to think someone else sent it. Sorry, The only person responsible for this “bombing attempt” is Soros himself. This is a textbook, “false flag” event, used to gain sympathy for Soros, smear legitimate critics as “violent,” and to distract the public from Soros’s sponsorship of the criminal invasion from South America. To the great Patriot that tried this. Good try don’t be discouraged keep up the good work and better luck the next time. Am I imagining it or has anti-soros media been bleached or very well hidden from the Net. The bomb container featured a backwards MAGA hat with an attached Kavanaugh picture from 1986 covered with hearts and kisses. “Benign Philanthropist.” That’s like calling Mengele a caring physician. I actually don’t believe it, I think it was a plant from the Left to try to gain support for him. Who in their right mind would pick up what they thought was an explosive device and MOVE IT TO A DIFFERENT LOCATION? It doesn’t pass the smell test! Why would anyone want to kill Soros’ illegal alien servants? Drudge Report just posted that the Clintons and the Obamas received similar pipe bombs in their mail that were intercepted. I think we’re seeing either a warning to all three parties to remain faithful to omerta (code of silence) or a false flag event is being planned or is in the works. We almost had a world MINUS George Soros!? Awww…. They have never been photographed together until now. I think anyone looking at the current alleged list of recipients will see straight away that this is another hoax. This is as “real” as SHES. Even Holder was a recipient. I smell Brock all over this. This is one of the “new ones” allegedly “mailed” to CNN. Note the lack of a postmark. I know of no way that can happen if it were really mailed. What a loser this mutt is. These idiots are SO PREDICTABLE. Anyone who votes for them is a moron. Isn’t it odd they don’t seem to be talking about this? It seems “false flag” is the leading trend at Google. The return of the vast right wing conspiracy so the average marshmallow dullard gets the sympathy feelz for the poor downtrodden democrat AKA CPUSA party. The desperate caravan of strong healthy military aged men didn’t work so now this bomb scare. Where is the mighty FBI? Too busy trying to overthrow a sitting president. From one sound bite, to the next, to the next to the next, always in a desperate frenzy to get one more moron to believe in their Antichrist atheist totalitarian Marxist agenda.